When looking at infrastructure markets throughout the world a common word used for the United States and Europe was stuck. This is not the case for the Gulf region. Unlike the US and Europe, the Gulf is developing new key infrastructure assets at a robust pace. Why? The main reason is that it does not suffer from crumbling infrastructure, in part, because the Gulf region had little infrastructure to speak of 50 years ago. Older economies (the US and EU) have had trouble gaining momentum and public acceptance to raise funds to repair an old infrastructure, whereas the Gulf is built on limited infrastructure from pre 1960. More recently this region has invested heavily in diversifying its economy away from oil and gas. Today the region continues to grow in population and and public requirements. As it continues to put money into new infrastructure and considers future funds, new modes of transportation and facilities are primed for the future. The Gulf region’s infrastructure development is gaining ground. However, governments and industries in this region are pressured to perform and deliver more for less. In 2017, lower hydrocarbon prices weighed on economic expansion — they are now expected to rise. According to Fitch Solutions research, the Gulf Cooperation Council (GCC) economies will see a notable acceleration in GDP growth. How has the Gulf invested in infrastructure? The Gulf region has been spending more in infrastructure development (airports, ports, roads, water etc.) in comparison with the US and Western Europe. Initially the development of infrastructure in the region was funded off the back of the first oil and gas production in the 1960s. In the mid-2000s, the approach in the UAE was ‘build it and they will come’, with few constraints and legal restrictions. However, in 2008 this trend came to an abrupt end when the Foreign Direct Investment (FDI) scaled back due to the global financial crisis. However, before the crash Dubai had built major iconic firsts like The Palm and Burj Khalifa and developed economic free zones around facilities such as ports and airports to encourage additional investment. The Gulf is a trading region and this has continued with the development of the Port of Jebel Ali (owned by DP World). Additionally, the region has developed major transportation assets with four airports carrying 20 million passengers a year each. Dubai International Airport is a major hub airport and handles over 88 million passengers in 2017 as well as over 2.65 million tons of cargo. However, the political relationship between the various countries in the Gulf region has created international geopolitics uncertainties which can temper trade. Does the Gulf need to build more infrastructure? 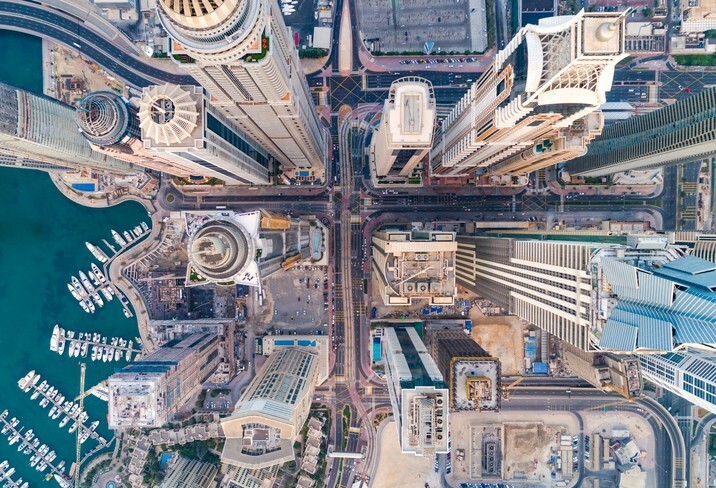 Substantial investment in Dubai’s and Abu Dhabi’s transport, energy and tourism sectors will drive robust growth in the UAE construction sector over the coming decade. The Emirates’ prioritization of infrastructure development as part of their economic diversification efforts and a subsequent pipeline of projects worth over USD300bn makes the GCC a global highlight for the industry. Considerable opportunities for foreign involvement will also remain. Saudi Arabia’s Saudi Vision 2030 Realization Program has planned for USD48bn worth of transports and social infrastructure. As part of this strategy, the government has outlined infrastructure projects spanning the power, water, hydrocarbons, road, rail, seaport and airport sectors. These include the Haramain High-Speed Rail a project which connects Jeddah to Median in just 90 minutes at a speed of up to 330 km per hour, Jeddah’s King Abdulaziz International Airport’s new USD4bn terminal and USD3.2bn for the world’s tallest control tower (135m). There is now political will to drive forward new legislation to help privatization. A range of public private partnerships (PPPs) to facilitate the use of long-term private financing to underpin a large proportion of capital projects. The railways will be a major development in the region as, for example, Oman does not currently have any rail infrastructure. Oman Rail, a state-owned company, will be responsible for building it and is part of the broader project for a Gulf Railway. The railway project extends to 2117 km and passes through six gulf countries from Kuwait to Oman. However, last year the committee of the ministers of transport in the GCC decided to postpone working on the Gulf Railway Project from 2018 until 2020–2021. Further proof of the pull of infrastructure in the Gulf region is the World Expo 2020, hosted by Dubai. The Expo site covers 4.38km2 and is located in the Dubai South District, halfway between Abu Dhabi and Dubai. It will be served by three international airports (with the new multi-runway Al Maktoum International Airport only six km away), a world-class road network and a new extension to the Dubai metro system (which only started operations in 2009). Qatar is forecast to spend more than USD200 billion on construction in the next decade and much of the money is going towards preparations for the Qatar World Cup 2022. This includes ports and highway expansion as well as building world-class stadia. Qatar plans to spend an average of 10% or more of its GDP on building infrastructure in preparation for the World Cup. In regards to diversification, Abu Dhabi is spending $37 billion on various projects up to 2020, including the completion of a new airport terminal and the nuclear power plants in Barakah. In Dubai, the world’s largest single-site solar park is located near Al Qudra can generate up to 200MW, enough to power 50,000 residences for one year. The DH1.2 billion project is part of a multiphase solar park that, when completed, can generate up to 1,000MW by 2020 and up to 5,000MW by 2030. In Kuwait, the Sheikh Jaber Al-Ahmad Al-Sabah Causeway Project is nearing completion. It is being built across the Bay of Kuwait costing around USD$3 billion with the aim to reduce the travel distance between Kuwait City and Subiyah area from 104–36km, cutting journey time from 90 minutes to less than 30 minutes. Can the Gulf’s economy move on from oil and gas? The short answer is not at this time. The Gulf economies are still very much dependent on oil and gas. Despite the low oil prices they will see some of the most notable acceleration in real GDP growth. Oil prices have a substantial impact on public spending for these countries, feeding their infrastructure development and improved household purchasing power through government spending on wages and subsidies. They have been diversifying their economies to be less dependent on oil and gas, however, investment continues to exceed other sectors. Historically, the region relied upon attracting foreign partners to help develop their hydrocarbon businesses as well as build infrastructure. However, regional geopolitics has, over time, impacted strategic foreign investor’s interest. 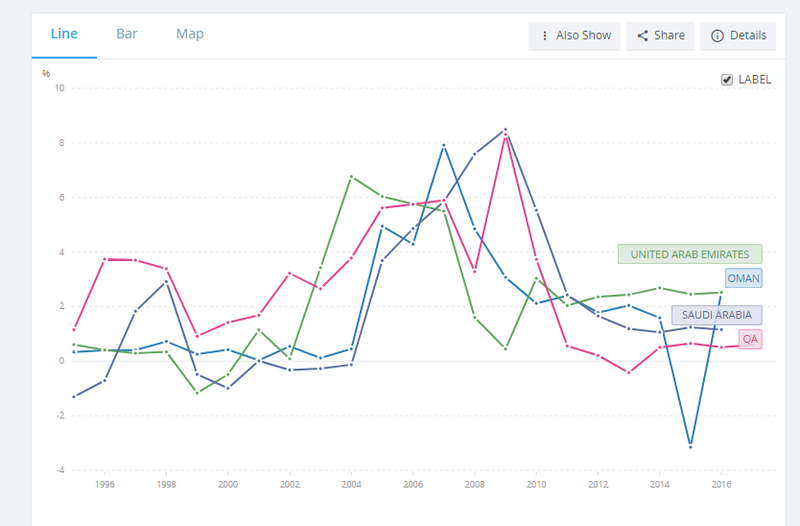 With regard to foreign funding, the chart displays the bigger portion of GDP from FDI in the UAE when compared to other countries in the Middle Eastern region. The FDI has not seen substantial growth in the last few years. A new form of recycling finance was seen last year with the USD3.1bn bonds for Abu Dhabi Crude Oil Pipeline LLC financing raised on an existing infrastructure asset. The anticipation is that the proceeds are to be used for investment in new infrastructure. Can the Gulf achieve more world firsts? Other examples of the Gulf region being at the forefront of building world class infrastructure is the Qatar LNG facilities, which is the largest facility in the world (Ras Laffan) and the World and Palm Jebel Ali. The first Hyperloop prototype pods that will transport passengers from Dubai to Abu Dhabi in just 12 minutes (1200 km/h) have been unveiled. This level of speed is achieved by reducing air pressure inside the tube to an equivalent measure experienced at 200,000 feet above sea level. The vehicles could be launched as soon as 2020. Dubai’s road transport authority is working closely with Virgin. If introduced in future, the Hyperloop technology will impact town planning and the availability of parking spaces. It will revolutionize people mobility between various destinations in the city and logistical hubs like airports and ports. The system could be expanded to link the UAE with neighbouring Gulf countries so that a trip between Dubai and Saudi capital Riyadh, which is currently two hours by plane, could be completed in less than 50 minutes. Another broader development that will inevitably have a meaningful effect on infrastructure globally is driverless cars. Dubai has begun testing autonomous pods in a trial run and aims to make 25% of daily transportation self-driven. The evolution of infrastructure in the Gulf region is striking compared to the pre oil and gas developments in the mid 1960s. Implementing measures to move away from hydrocarbon revenues has helped to diversify the Middle East’s economy. The region continues to invest in major infrastructure at a pace well ahead of the Western economies, even after the global financial crisis lowered hydrocarbon revenues. Exciting plans for additional infrastructure development in the future (including railways) and the development of new mega cities in the region are likely to follow on from their current world firsts.